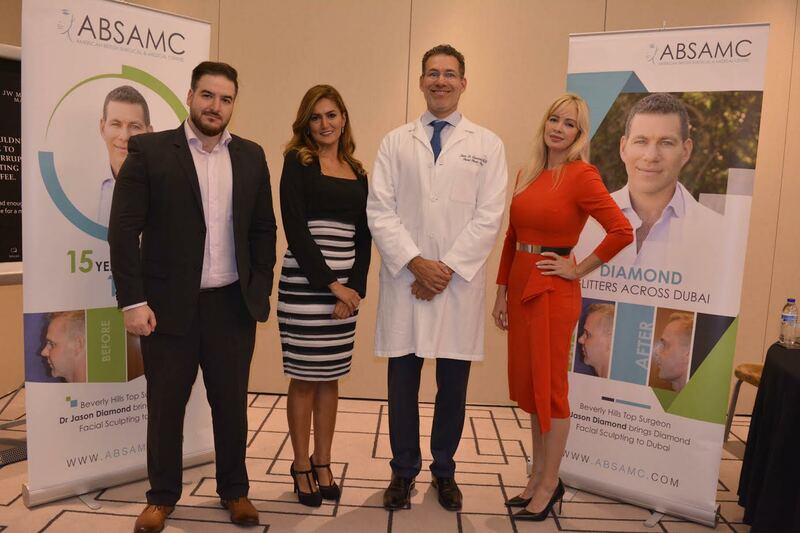 The American British Surgical & Medical Centre (ABSAMC), has announced that it is bringing the Middle East region’s the ‘Diamond Facial Sculpting’ (DFS) technique to Dubai–a procedure created by world-renowned Plastic Surgeon Dr. Jason Diamond. The announcement was made today, October 6, 2016, in a press conference held at the JW Marriott Marquis in Dubai. During the exclusive event, Dr. Diamond, who is listed as one of the ‘Top Injectors in the World,’ introduced and showcased the ‘Diamond Facial Sculpting,’ along with its benefits and advantages. ABSAMC’s new ‘Diamond’s in Dubai’ campaign throws the spotlight on ‘Diamond Facial Sculpting’, and the centre is the only facility with complete exclusive rights offering this technique in the region. DFS was created by Dr. Diamond to address the demand required by his ever film-ready clientele in Hollywood. The non-invasive treatment is a unique ground breaking 15-minute facial sculpting and facial rejuvenation technique that provides standard results and makes the patient appear 10-15 years younger. At the event, Dr. Diamond explained that DFS is a non-surgical way to both lift the face and create significant improvement with facial sculpting and definition using an injectable filler, which are injected on the bony surfaces of the face, including the high lateral cheek bone, the jaw angle and the central chin. Through his revolutionary procedure, the fillers are placed deep onto the bone–literally changing and enhancing the shape and structure of the bone. Dr. Diamond, whose hard work and carefully crafted surgical skills are backed by several prestigious accolades, including being double board certified by The American Board of Facial Plastic and Reconstructive Surgery and The American Board of Otolaryngology. Medical experts have shared that some of today’s stunning celebrity faces have two enviable traits in common–a defined bone structure and flawless, youthful-looking skin. With this in mind, Dr. Diamond’s ‘Non-Surgical Facial Sculpting’ not only helps drive in key results to a patient’s facial appearance but also does away with the long healing phase common among surgical procedures. “I am privileged to be working with ABSAMC in Dubai, which is now widely recognized as the definition of beauty, happiness, luxury and comfort in the GCC. The emirate has become a melting pot of beautiful people from different cultures from around the world and being here allows me the opportunity to offer my services to the beautiful people in Dubai. I’m looking forward to helping thousands of patients achieve a more youthful, natural-looking appearance,”concluded Dr. Diamond. The American British Surgical & Medical Centre (ABSAMC) is a dedicated facility committed to providing the best possible care for its clients. The centre is composed of some of the best Plastic Surgeons. These specialists work exclusively at the Dubai clinic and serves the population in the Middle East. Aside from its Dubai facility, ABSAMC also has a presence in London and Riyadh. The company takes pride in its patient-centric approach to healthcare, which means that care delivery is shaped around the individual, their desires and their very individual needs.